Modern European states devised the political system of parliamentary democracy in which elected agents govern states and municipalities. However, women have been excluded from becoming ‘representatives’ for a long time. The question, thus, must be asked: who can be deemed a ‘representative’ within the system of a representative democracy? Gender quotas appear to be successful in increasing the number of women elected to legislatures, but their inclusion does not necessarily imply a transformation in the masculinist nature of parliaments. 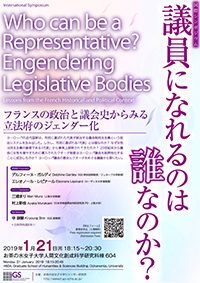 This symposium will discuss the characteristics of gendered legislative bodies in the light of the history of European parliaments and arguments with regard to gender quota system.